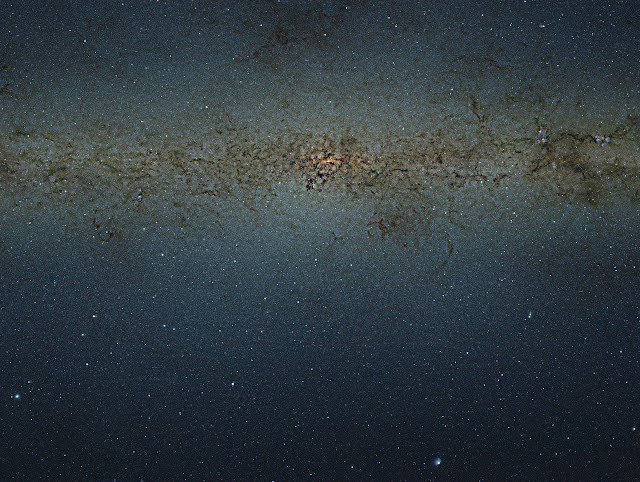 The Visible and Infrared Survey Telescope for Astronomy (VISTA) captured a nine gigapixel image of the center of the Milky Way Galaxy. Astronomers have used this image to catalog more than 84 million stars within it. Because of the high resolution of the image (108,200 by 81,500 pixel), if printed in regular resolution as that of a book, the image would be 9 meters wide by 7 meters tall. This is one of the biggest astronomical images ever produced. This central area of the Milky Way, called the Bulge, has a large concentration of very old stars but is obscured by dust. Dust in space usually called space clouds are massive cosmic structures. The largest, called giant molecular clouds, reach diameters of 100 light-years (9.5×1014 kilometers) and densities of around 100 particles per cubic centimeter (cm3). To get around the obstruction, they used infrared light. With this wavelength, astronomers were able to see the stars surrounding the center of the Milky Way galaxy without the obstructing dust clouds. They then prepared a color-magnitude diagram for each star in the area, all 84 million stars. A color-magnitude diagram is graph that plots the brightness of the object against its color. Using different image filters, they also measured the color of the objects. With the color-magnitude diagram, astronomers cataloged the properties of the stars such as its temperature, mass, and age. This is the first time that the entire Bulge has been subject to this image and data processing technique. This study contains more than ten times more stars than any previous studies. The new colour–magnitude diagram of the bulge contains a treasure trove of information about the structure and content of the Milky Way. One interesting result revealed in the new data is the large number of faint red dwarf stars. These are prime candidates around which to search for small exoplanets using the transit method.